VeganMoFo #30 - Fusion Challenge! (Again!). This post originally appeared briefly on day 23 due to some confusion over changing the order of prompts. But only a few people had read it before I took it down, so sorry if anyone is confused as to why it is here again. 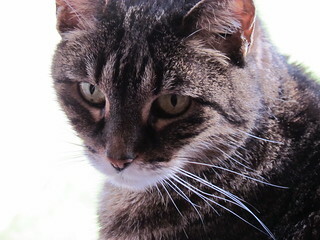 However, there is a different picture of Gizmo at the end now, so please at least check that out if you did already read this because it is my favourite photo of her. I cannot believe that the final day of MoFo is here! What a fun month. I had to do a lot of advanced planning and writing to get it done, but it was definitely worth it. I loved the prompt system this year, because it helped to guide and inspire me. So here is my final post for VeganMoFo 2015. For a long time, I have wanted to get a copy of Fusion Food in the Vegan Kitchen by Joni Marie Newman because it sounds pretty amazing. However, for a long time I have been on a pretty strict cookbook budget, so it has been sitting around in my wish list. I knew it would provide me with the perfect recipe for this challenge, however even if I did break the cookbook budget and order it, it might not be here in time! Thankfully, Joni has provided some recipes from the book on her blog. There are some pretty tasty looking ones here, but I eventually settled on Sloppy Joe Pho, and intriguing mix of pho and sloppy joes. To create this recipe, first you simmer a flavourful pho broth. For this, I subbed in some star anise instead of aniseed. After I simmered for 30 minutes, I didn't have a huge amount of broth left, so I wonder if I was a little too enthusiastic about simmering. The sloppy joe component is TVP-based. I used some chopped carrot in place of the capsicum and also added a bit of extra ketchup once it had finished soaking. For the noodles I found some great Wokka-brand instant brown rice vermicelli noodles, and I used one little cake for each serve. Put noodles in a bowl, top with the TVP mix and ladle broth all over it! Garnish with fresh coriander and green onions, I did not use jalapeno. I really liked this, it was a good mix of flavours. The recipe says it makes three main dish servings, but I only got three. The third serving, which I took for lunch the next day, was pretty light on broth. I can't wait to finally order this book and be able to play with all the fun fusion flavours inside! And so ends VeganMoFo for 2015. Thank you to everyone who read and commented on my blog and Instagram posts. I have had a great time reading your posts as well, and my blog feed is now bigger and better for it! As MoFo comes to an end, so too does my month of Gizmo. 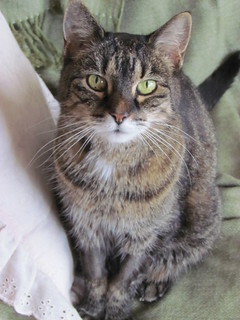 I hope you have enjoyed seeing photos of her, as much as I have enjoyed sharing her with you. I miss this beautiful girls every single day, and consider myself so blessed and lucky to have been able to share my life with hers, even if it wasn't for long enough. I leave you with this photo, which was taken on her final Christmas day in 2011. I didn't know it at the time, but I only had three weeks left with her. You can see she is thin and that she has had bit of fur shaved off for IVs and bloods and ultrasounds, but the sweet sweet look sums up everything about her perfectly. VeganMoFo 2015 #29: Road trip snack attack. 29. 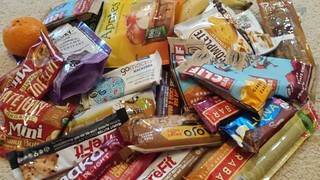 What would you bring on a vegan road trip? Another weekend of OzComicCon done! I had a wonderful time, though I have succumbed to the dreaded ConFlu, but it was worth it. Long days, but great people! I was a guest handler, and looked after Brian Krause (who was Leo in Charmed), and he was lovely. I also discovered that Evanna Lynch (Luna Lovegood from Harry Potter) is a vegan cat lady, and speaking of vegan I had some delicious dinners in Sydney as well! Now I have a weekend of MoFo posts to catch up on, but first I give you today's penultimate post! I kind of don't mind road trips, if you are going somewhere exciting, have pretty scenery and a good soundtrack. Good company is nice, but I am happy to road trip alone. Of course, being a road trip you need to have road trip snacks. It is no good to get hungry. I have a handy little cooler, so for longer trips I generally will pack a sandwich or two. Often peanut butter features in my sandwiches, because it is easy to eat one handed and not get filling dripping everywhere. Also, you don't really need a cooler for peanut butter sandwiches, though if you are having fancier fillings it is probably advisable. Cookies are good to. Preferably home baked, because store bought cookies tend to be a bit too dry and crumbly, so you get crumbs all over your lap. Also maybe some hummus and veggie sticks, for when you are a passenger or if you stop somewhere. Fruit is also good. Bananas are best for driving, if someone peels it for you. Nothing too juicy or sticky. Actually, this photo doesn't quite give you an accurate idea of the actual size of my pile. Yeah, okay, so I am a panic buyer when it comes to being hungry. This pile is a little leftover VVC swag bag, and a lot of random buying at grocery and health food stores. I put this pile together for my OzComicCon weekends, because with long hours and limited food availability I needed to know that I could eat if I got hungry. The thought of being stuck somewhere and being hungry causes mild alarm, I always have a couple of bars in my handbag everyday just in case. So I think it is best to be prepared. So don't worry, if you are road tripping with me you won't go hungry! 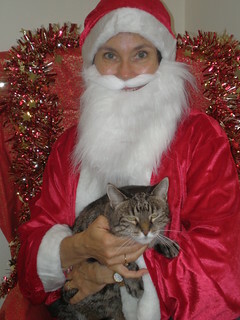 One year Gizmo met Santa. You can see how thrilled she was about this. VeganMoFo 2015 #28: Team burrito! 28. Tacos VS Burritos. Where do you stand on this important issue? Today I stand bravely before you, risking the certain scorn of many of my brethren, and proudly declare that I am team burrito! But sometimes I'll be eating a taco and I'll just think... I wish this was a burrito. Okay, I am taking cover now. But there is something about a satisfying chunk of filling all wrapped up in a big floury tortilla that just gets me that little bit more excited. Granted when I was growing up, tacos were in crispy shells and came out of a box, but even now with my new found taco appreciation, chances are I will still order the burrito. 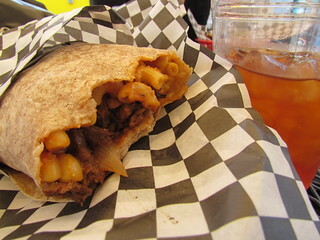 I mean, the Westergram taco from VVC was great, but who can go past the MacNoCheeto Burrito from Homegrown Smoker in PDX? I get so happy when I hear the words breakfast burrito. This amazing creation is from Smith & Daughters in Melbourne. 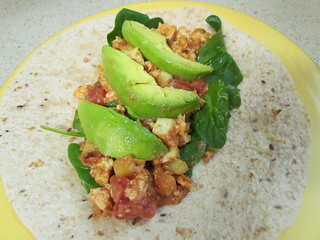 To celebrate, I decided to make the Breakfast Burrito from Hearty Vegan Meals. 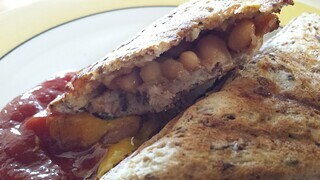 This burrito has a filling of potato and scrambled tofu, mixed up with a great sauce that include fire roasted tomatoes, HP sauce, peanut butter and ginger. 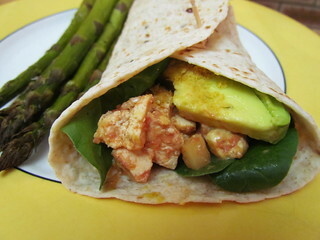 The recipe just says to add avocado to the wrap, but I also added some baby spinach and nooch. Yum! I have to admit that I am having a bit of fun in this post, but really I think that tacos and burritos are both excellent foods, and to be honest my feelings on the topic are not that strong. Though I do prefer burritos, but I hope my taco friends will still find it in their hearts to love me anyway. I will definitely admit that tacos are much more photogenic than burritos! 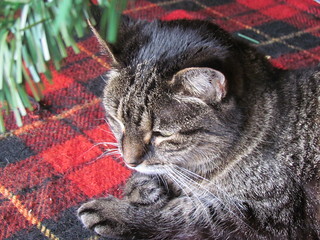 Gizmo sitting under the Christmas tree. If only I could wish very hard and find her under there this year. 27. Favourite herb or spice? Without a doubt, my favourite spice is cinnamon. I love it so much! I always have it sprinkled on PB toast or PB/banana toast, and when it is called for in a recipe I always add extra. You cannot have too much cinnamon! Oh cinnamon, how do I love thee? Let me count the ways. I love you as a cinnamon sugar doughnut. Really, these are the only doughnuts I care about, you can keep all your strange glazed doughnuts with crazy toppings. 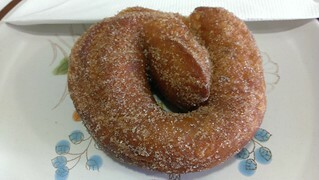 Cinnamon doughnuts are what it is all about. And the best cinnamon sugar doughnut is found in Melbourne, where Crumb's makes a sourdough cinnamon sugar doughnut you can only dream about. Thankfully in four weeks I won't be dreaming, I will be eating. 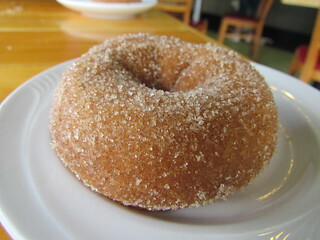 The cinnamon doughnut from Mighty-O in Seattle was my favourite for a long time until I tried Crumb's last year. It is still outstanding, even if it is no longer number 100. 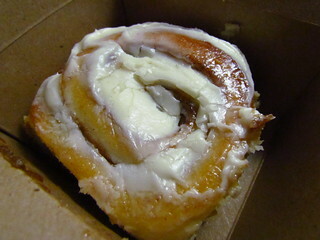 I love you in a cinnamon scroll! 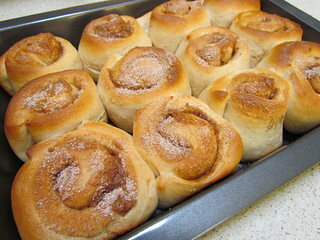 Preferably without glaze, because who needs super sweet glaze when you have already got yummy dough and delicious cinnamon? I left the glaze off these ones that I made from Vegan Brunch. But sometimes a cinnamon roll is so good, that I can forgive the glaze. Like this Chicago Diner cinnamon roll aka best cinnamon roll ever (but would be ever better without the glaze). 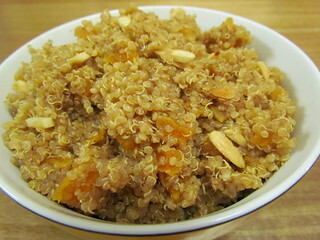 I love you with grains, like this Cinnamon Lime and Quinoa with Apricots and Almonds from Eat, Drink, & Be Vegan, to serve with savoury dishes. Or to serve with sweet grains, as with Breakfast Porridge with Raisins from Blissful Bites. Sure, it says to add a generous dash of cinnamon, but we know that that means add a whole lot more! 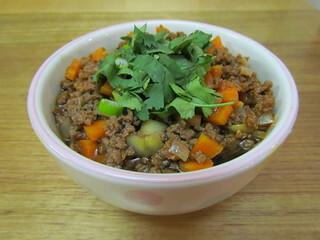 I haven't blogged this recipe before, so I had best give it a rating! 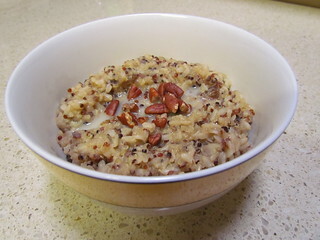 It is a great mix of brown rice, quinoa, raisins, maple syrup and of course lots of cinnamon! 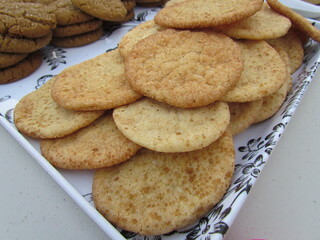 Snickerdoodles would be meaningless without you to coat their outsides. You are also good on muffins. Or as cinnamon toast. Or any of the other million ways you make life better. Thank you cinnamon, for being you! 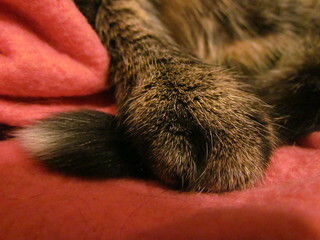 Perfect Gizmo paw and tail. VeganMoFo 2015 #26: The apocalypse is nigh. 26. It's cold and rainy and there's a snow drift outside your door! What are you going to make using the ingredients you have? First off, if this happened to me the first thing I would do would be to freak the heck out and cry a lot, because it does not snow where I live and if there was a snow drift blocking me in then it would mean that something had gone terribly wrong and the end was pretty seriously nigh. Chances of me getting out of bed in such weather are pretty low, though I guess I would have to get up to feed the cats breakfast eventually because Sahara can only wait so long. OK, so I have cranked the central heat up to infinity (wait, do you lose power if there is a snow drift? I hope not...) and pulled on some very warm clothes and made it downstairs. To be honest, because I am a bit of a food hoarder there are probably a lot of things I could make, because I keep a pretty well stocked pantry, freezer and fridge. Assuming the power is still on. However chances are I would be so confused and miserable that I would just need to eat a lot of cold day carbs. For example, this would be a good breakfast! I had this recently when I was feeling a bit under the weather, and I can assure you it is good for a cold morning to get you going. It is a piece of toast with peanut butter, banana and cinnamon and a mug of chocolate chai (made with some cashew milk I recently bought to try). Moving on to lunch, I think it would be pretty similar. 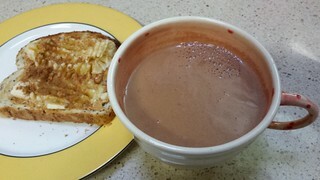 One of my favourite things to eat on a cold day is jaffles! There are a lot of different filling options for jaffles, I have put almost everything in them at some point or another, however I am a huge fan of the traditional baked bean and cheese jaffle. I always like to dip my jaffles into a mix of ketchup and mustard as I eat them. 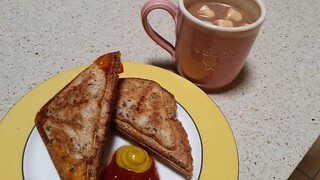 Served here with some cashew milk hot chocolate with a few mini pumpkin Dandies that I brought home from the US. Abe's Hearty Lentil Soup from The Abundance Diet by Somer McCowan is pretty much the best lentil soup I have ever had, and I have made a lot! The always have onions and carrots on hand, as well as lentils and tomato paste. I normally have roma tomatoes as well, though in a pinch I have plenty of tinned diced tomatoes I could drain and use. I don't always have celery, but that is an easy omission, or I could add some frozen peas! When I made this, I had all the right ingredients. I think what makes this so good is the use of both Braggs and nooch in the soup, so yum! It calls for Spike herb seasoning, and I don't know what that is, so I used some left over 10-spice blend from Oh She Glows. 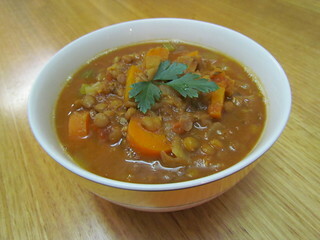 This lentil soup will change your life, and is just the thing for a freezing cold night! Gizmo knew a thing to two about staying warm. Here she is snuggled into her birthday bed. Even though it was late spring and into summer. 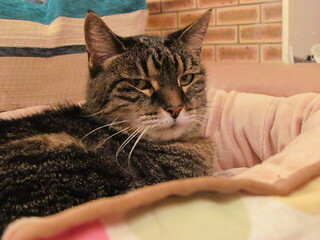 She was a funny girl, when the weather got warm she could often be found in close spaces or underneath blankets! Vegan MoFo #25: My favourite cuisine. 25. Share your favourite cuisine. This was another tricky one, because I love lots of different cuisines! I managed to narrow it down to two that I do consider my favourite. It came down to a tie (hee) between Thai and Japanese. Actually, when I think about it there are a lot of Thai dishes I need to be careful with, because I am sensitive to coconut fat (and there is a lot of coconut cream or milk in many curries) and also I don't like things spicy, but Thai gives us one of my favourite dishes of all time - the Pad See Ew. If I see this on a menu, I just have to order it! I also love thai peanut sauce (either for dipping or as a stir-fry sauce), and Pad Thai is pretty great as well. Eating out at Thai restaurants can sometimes take a little bit of discussion to work out with the kitchen what has shrimp paste, oyster sauce, fish sauce or animal stock in it, but generally you will end up with something delicious. My favourite Thai place is the all-vegan Araya's (in Seattle, of course). 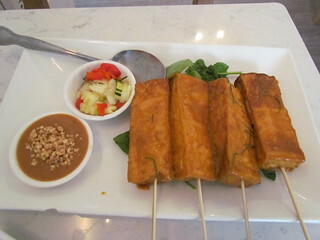 Their tofu satay has the best peanut sauce in the world! 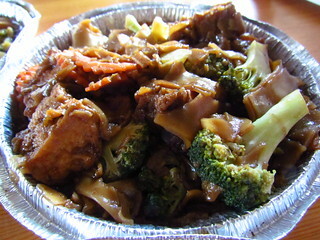 One of the better Pad See Ew's I've had recently was from In The Bowl (also in Seattle). It had the right ratio of noodles to tofu and veggies and had a great sauce. 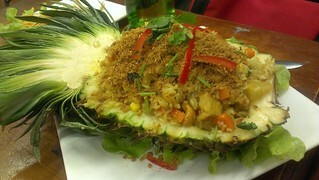 When I lived in Sydney, I used to love going to a Thai place called Green Palace, and they made the most amazing pineapple fried rice. No pineapple fried rice has come close. Eating out at Japanese restaurants brings its own challenges, as bonito or fish seems to be in everything! However finding delicious, vegan friendly Japanese food is well worth it (and if you ever do travel to Japan, there is plenty to be had in the major cities!). My favourite is eggplant dengaku, which is so delicious! Eggplant in miso sauce? You could not go wrong. 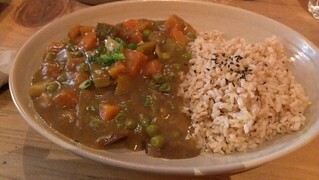 I love Japanese Curry, like this one I had last year in Melbourne at Yong Green Foods. Of course I love sushi as well. 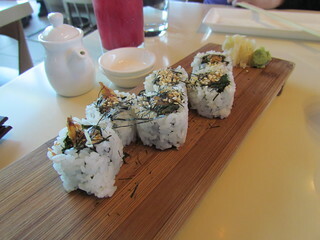 Here are some delicious sweet potato rolls from Departures in PDX. One of the highlights of actually eating in Japan was the beautiful set lunches, so many options all on one beautifully presented tray. 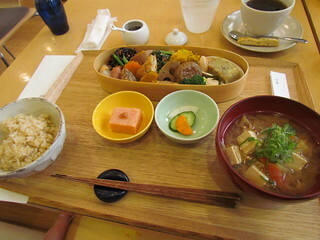 This was the weekly special set meal from Brown Rice Cafe in Tokyo. To celebrate my two favourite cuisines, I made a new dish from each of them! Thai Hangover Noodles with Tofu and Thai Basil from Vegan Without Borders (by Robin Robertson): I loved this noodle dish! I used a sprinkling of red pepper flakes rather than fresh chilies, because fresh chilies are far too spicy for me! 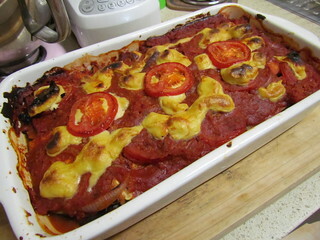 I also subbed out capsicum and used zucchini instead. The sauce is a delicious blend of soy, vegetarian oyster sauce and sugar, I ended up doubling that to get enough to coat the noodles properly. The recipe suggested using Golden Mountain Sauce if you could find it instead of the oyster sauce, I did find it but it had an ingredient derived from fish in it, so I left it on the shelf. 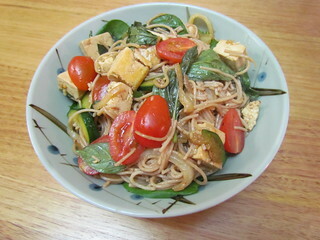 For the noodles I used some great brown rice vermicelli I found in the supermarket. All up delicious! 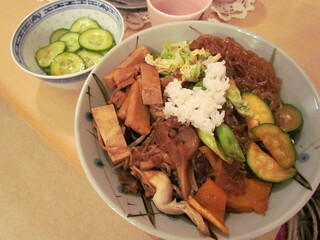 Sukiyaki and Cucumber Salad with Wa-Fru Dressing came from a book called Japanese Cooking. Before she was a cheese and pantry queen, Miyoko Schinner wrote this beautiful book. The sukiyaki is extremely delicious! I used all tofu (rather than a mix of tofu and seitan), a delicious mix of mushrooms, butternut, zucchini, shiritaki noodles, wombok and green shallots. I had to leave off the bean sprouts because when I opened the bag they had gone slimy, gross. I only used a half quantity of ingredients (and got two and a half servings), but made the entire amount of sauce (is is so good!). Served over Japanese rice. The cucumber salad was light and refreshing as a side dish. 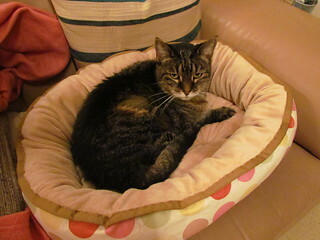 I got this great Fuzzyard bed for Gizmo for her 15th birthday, she loved it! Sahara loved it to, and continues to love it to this day. VeganMoFo 2015 #24: Nathan Fillion. 24. What (insert well known person) would eat if they were vegan. Let me tell you about my future husband. His name is Nathan Fillion. For Browncoats, Nathan will always be the captain of our hearts, and the tightpants of our dreams. A lot of people would now know him from his current show Castle, but he is always Captain Malcolm Reynolds to me. Okay, okay. So he has a gorgeous girlfriend and he lives in a different country and my cunning plan of winning him over by being in a different country and not being an ex-Baywatch actress and basically having no contact with him whatsoever is taking its damn time. 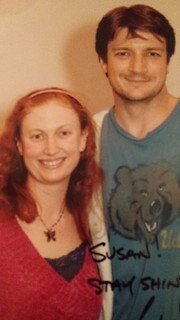 However, I did meet him this one time at a convention in Sydney, so I guess that memory will have to sustain me. Anyway, in alternate universe land where crazy things happen, maybe I would be making dinner for Nathan. Now, Nathan is definitely not vegan, though his co-star Molly Quinn is, so I am sure she has laid some good groundwork with him about how delicious vegan food is, and I'm sure once we met it would be a quick trip to vegan town for him. One of the foods Nathan is famous for on the internet is his Seven Layer Bean Dip of the Gods (note, if you haven't seen Doctor Horrible's Sing-A-Long Blog, do so immediately... and then listen along to Commentary! The Musical... yes, they did a musical commentary). His recipe is actually vegetarian to start off with, and would be easy to make vegan. 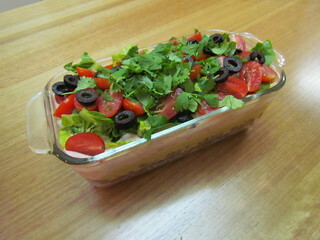 I decided to mix it up a little, by making the Seven-Layer Bean Dip from Blissful Bites by Christy Morgan. This recipe makes a huge amount, so I just made a half batch. Layers according to the recipe are a mix of pinto beans and chorizo, a layer of sour cream and salsa, a layer of guac, a layer of shredded Daiya, a layer of shredded cos lettuce, a layer of halved grape tomatoes and a layer of black olives. I changed it up a little. 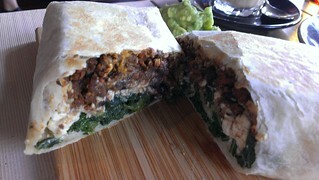 For the bottom layer I used a mix of pinto beans and the TVP chorizo recipe from Hearty Vegan Meals. I then had a layer of the Nacho Chee-Zee sauce from Bake and Destroy, because this was still warm and I didn't want it to make the lettuce go soggy. 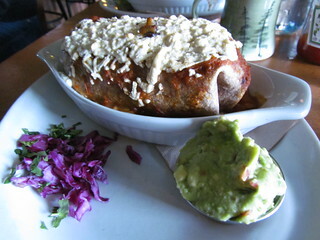 Then I had a layer of tofu sour cream from But I Could Never Go Vegan and salsa, then guac, lettuce, tomatoes and olives. We had this for dinner, rather than as the snack it was designed to be, which was kind of ridiculous but it was very tasty! Just needed about three times the amount of guac because that layer got a bit lost. Nathan also mentioned in an interview with Oprah that his favourite meal is his mother's lasagna. 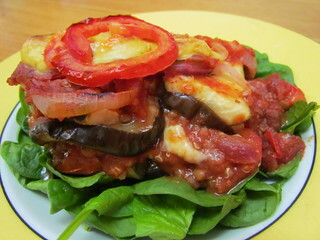 The Grilled Eggplant and Zucchini Lasagna from The Abundance Diet is not your traditional lasagna, but it is so tasty I bet Nathan would love it if he was vegan! I modified this a little by roasting the vegetables rather than grilling because I just didn't have time or inclination to grill them all on my tiny George Foreman. This lasagna is amazing - layers of marinara sauce (with lentils and quinoa mixed in), zucchini, eggplant, red onions and fresh roma tomatoes. All layered and topped with Somer's famous Moxarella, the easiest vegan cheese you'll ever make. This fills an entire 9x13 inch baking dish, and the serving sizes are HUGE (it serves 4). Despite the giant servings, it leaves you feeling light and full of great veggie goodness. 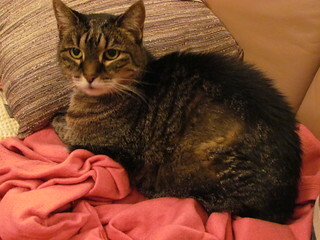 Another photo of Gizmo on her 15th birthday. This is one of my favourite photos of her, I think it is gorgeous. So, funny story. This prompt was originally called 'Autumn equinox eats' and was originally day 30 in the prompts. I prepared much of my MoFo in advance from a list of prompts I printed out some time ago due to my busy end of September. Since that list, they actually changed the prompts around, switching this to day 23 to be on the equinox itself. So this morning I put up what I thought was day 23 (fusion food), but is actually now day 30. Some had read it (and commented, thanks Babette!). I have taken that post down to put this one up today. The fusion post will reappear as the final day of MoFo post. Also I had prepared the post for the original prompt of autumn equinox, even though it is spring here. I don't know that I have ever used the word prompt so much in my life! Anyway, here is the post! Today's prompt originally was quite out of season for the southern hemisphere (Autumn equinox eats), because it is actually spring here. September is also the month of father's day in Australia, and every year I make a special father's day dinner. Due to some communication mishaps, we happen to have several bags of frozen cranberries in the freezer, and Dad suggested that he would like a dessert that included some cranberries. Plus he loves pumpkin. So I decided to run with the autumn equinox theme for his dinner rather than doing the more geographically appropriate spring equinox. 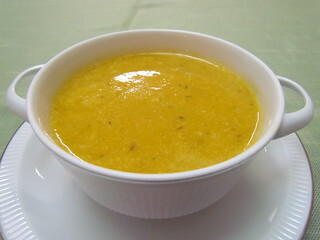 Cozy Roasted Butternut Soup from The Abundance Diet by Somer McCowan was the first course. This soup blends roasted pumpkin, onion and garlic with a noochy broth and a generous splash of sherry (which I found a little strong, I would decrease it next time). Pureed cashews provided some creaminess. 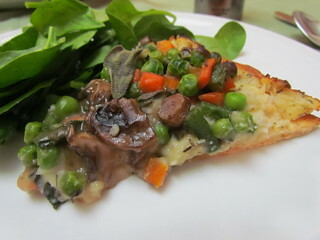 Shepherd's Pie Pizza from Bake & Destroy by Natalie Slater provided a fun main course. I made the pizza base using the recipe in Vegan Pizza (it is so easy). 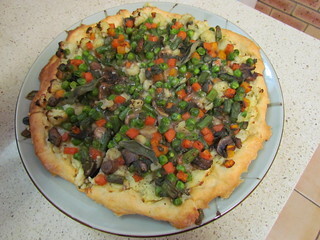 The base is slightly baked naked, then is topped with a herby potato mash as the 'sauce' and a layer of vegetables including carrots, cauliflower, green beans and mushrooms. Very yummy! It also passed the test of being fantastic cold the next day. 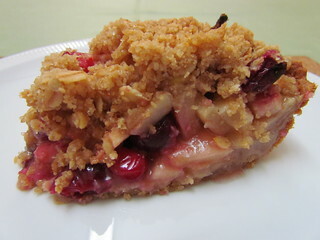 Cranapple Crumble Pie from Whole Grain Vegan Baking by Celine Steen and Tamasin Noyes was the final course, being the cranberry dessert, The tart pastry is made with a blend of wholegrain flours including wholemeal, oat and barley. It was quite a thin pastry, and tore easily. I used my deep dish 9 inch pan and it didn't quite go all the way up the sides. For the filling, the recipe calls for 880g of peeled and sliced apples. I stopped at about 600g because it was already a huge amount, and any more would not have fit into my pie plate! 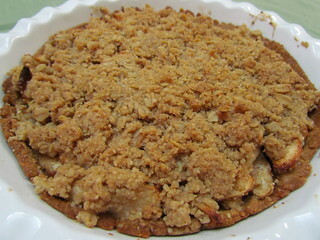 It is all topped with a great crumble. This was very yummy, though ended up being not entirely structurally sound when cut and served. Messy but good! VeganMoFo 2015 #22: Asparagus in the spring. VeganMoFo 2015 #20: A tale of two crumbles. VeganMoFo 2015 #19: Inside my lunch box. 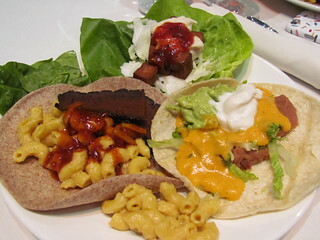 VeganMoFo 2015 #15: Guess who's coming to dinner? VeganMoFo 2015 #7: Fruity Oaty Bars. VeganMoFo 2015 #1: Rise and Shine!